A natural jute bag containing the perfect pairing of Port and Stilton with the addition of delicious Walnut Oaties. The timeless and classic combination of Stilton, Port and crackers is the focus of this gift. 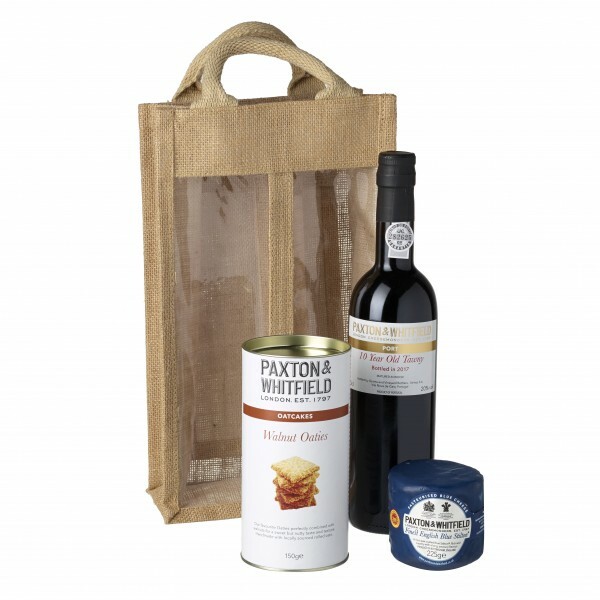 Paxton & Whitfield's Mini Waxed Stilton PDO 225g (pasteurised, traditional), accompanied by Paxton's 10 Year Old Tawny Port 50cl, and Walnut Oaties 150g, presented in a reusable, tall jute gift bag.